Writer's Software Review: AutoCrit Rocks! Home : Writer’s Software Review: AutoCrit Rocks! Let me preface this review by saying how much I despise programs that guess what you mean to write and then automatically insert corrections you didn’t mean to write; I turned off all the “artificial stupidity” features in MS Word long ago. AutoCrit does no such thing; it merely highlights places in your text that could be problematic, giving you the option to change them or not. Propellers spin down with a decrescendo whine. A beige Gulfstream Airways plane rolls to the tarmac. Through a chain-link fence, I watch a half-dozen people disembark and then disappear through the terminal door to get their passports stamped. I’m happy to wait outside. Inside the tiny terminal, a small crowd of people is stressed by long waits, late connections, overweight baggage and other inconveniences. Taxis line up to ferry tourists to their hotels. Twenty minutes later, they’ve all driven off. A woodpecker taps at a tree somewhere. The forest continues to buzz. A second plane hums over the pine tops. Eventually, a young woman with a floppy hat exits the terminal, looking around for a familiar face. “Are you Karen?” I inquire. Karen sizes me up, but I’ve mentioned the right people and I haven’t asked for money. She smiles at the absurdity of landing in a foreign country to jump on a boat with someone she’s never met, and perhaps over how I didn’t approach anyone else to ask if they were Karen. Somehow, in these islands, you just know. Certainly, there are clues. Bahamians and American expatriates returning to vacation homes in Treasure Cay have a certain familiar orientation; they’ve been here before. They often chat with a neighbor who happens to be on the same flight and are likely to be on a first-name basis with at least a few of the taxi drivers. Visitors bound for charter boats try too hard to look like seasoned sailors; there’s an air of costumery about them. Business people who ride Harley Davidson motorcycles and wear black leather jackets on weekends fail to convey authentic bikerness in the same way. Snow birds escaping Michigan’s arctic windblasts or the snows of upstate New York typically overpack. Wearing university t-shirts and cliché Bermuda shorts, they herd flocks of fighting children and heaps of suitcases through the terminal door while Mom admonishes everyone to put on gobs of white gluey sunscreen and pleads with her brood “not to run off and get lost.” Sailors returning to their boats wear sun-beaten, well-loved nautical hats and backpacks. They carry shopping bags stuffed with groceries and boating gear packed in boxes appropriated from unrelated merchandise. They don’t want to pay import duty on the expensive, new ‘used’ or ‘repaired’ equipment they carry, so they smile peacefully, blend in and try to appear invisible to the customs man. Escapees from cosmopolitan corporate cubicle farms can’t shift out of high gear. The women can’t leave their competitive, glamorous office girl demeanors at home. Ready to drink and play on a beach, they arrive wearing bikinis under loose shirts proclaiming loyalty to the latest fashion brands. Their men are either bound up with businesslike seriousness as they prepare to ‘negotiate with the customs agent and win,’ or they regress to a frat boy goofiness appropriate to a vacation world where regular rules and common sense don’t apply. I wonder if they’re disappointed when the Abacos doesn’t turn out to be the nightlife casino cruise ship wonderland depicted in countless Bahamas travel posters. The shallow waters in this part of the islands run deeper than that. The woman exiting the terminal is about my age, maybe a few years older. Wearing a long cotton dress, she’s slightly on the short side. There’s no recent sun in her face. She’s been hiding from winter in dry, heated rooms for months. Her look says ‘mountain’ or ‘desert’ rather than ‘city,’ and has a humble, unsophisticated aspect in line with the appearance of a writer, artist or academic. Wearing no makeup and carrying a single duffel bag, she’s obviously going to a place where closet space is minimal. But she can handle the road she travels on; she looks around and assesses her surroundings with obvious intelligence. She’s the obvious best candidate for the Karen I’m here for. Karen laughs. Anyone else, anywhere else, would suggest we walk over, bicycle over, drive over, hell…even skateboard over, but here in this strange world that began to surprise the moment her tiny airplane banked sharply over a tapestry of shoals and marshes and dived steeply towards a barely visible slot in a tropical pine forest, we’re going to row over. AutoCrit is not a software application that you install on your computer. To use it, open the AutoCrit website, copy/paste your text in the window and select the “Analyze My Text” button to receive a number of reports available via a series of buttons. The first report returned is the Overused Words Report. 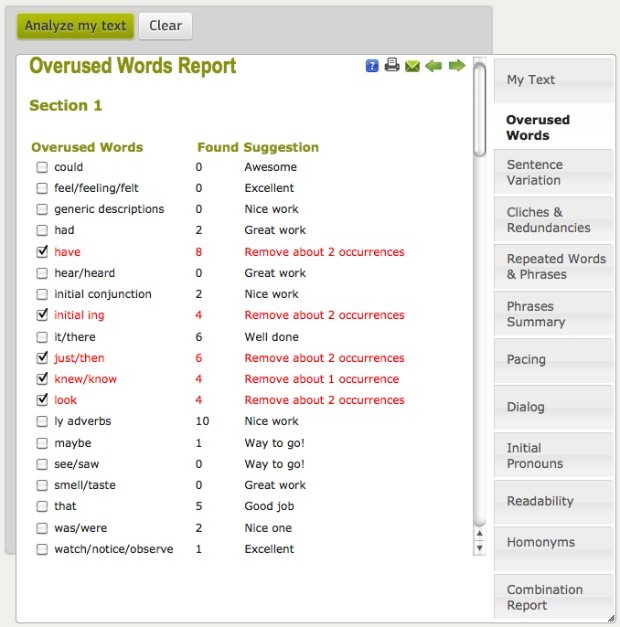 AutoCrit compares the frequency of commonly overused words in your text with the frequency of their use in mass-market fiction and offers recommendations for bringing your text into statistical parity with that standard. Use the checkboxes to turn highlighting on and off for various words. 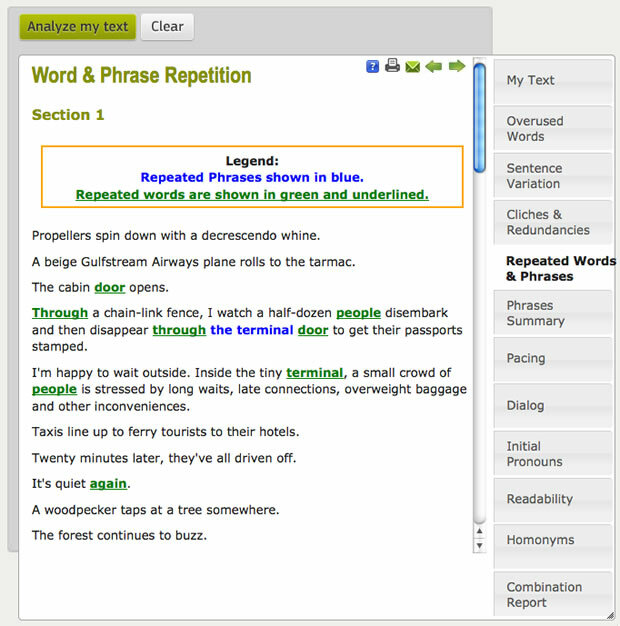 For example, words like “has and have” are often associated with passive writing; instead of writing “John has run the race,” it is considered better form to write “John ran the race.” Too many uses of “it” suggest that substituting more colorful nouns may offer opportunities to add spice where generic pronouns fail to inspire. Scrolling down, AutoCrit highlights overused words and patterns in the text. I won’t repeat the full text again for every report, but the highlighted words are revealing. Did you catch these errors on the initial read-through? I see things I want to fix already! The next report is Sentence Variation. 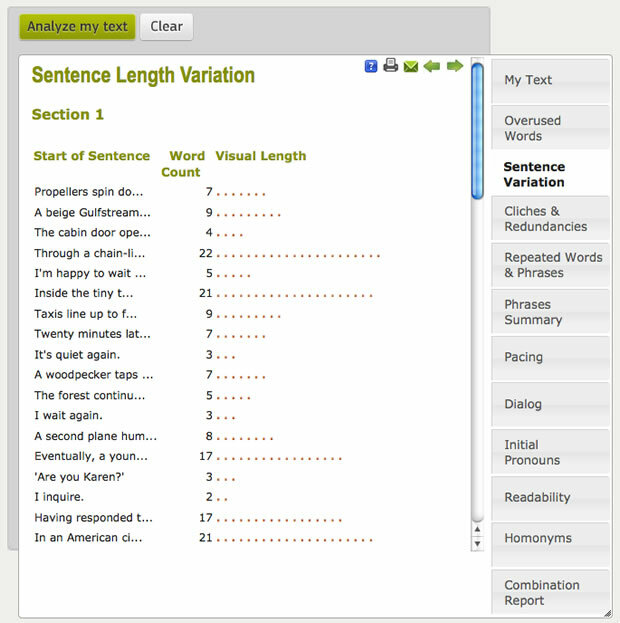 This screen shows you the relative number of words in each sentence. The recommendation is to mix long and short sentences to avoid repetitive rhythms that make the text hypnotic and sleepy to read. 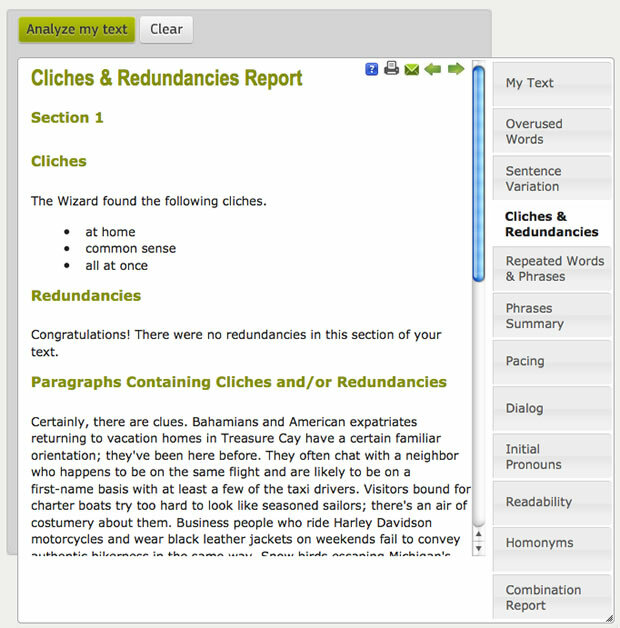 The Clichés and Redundancies Report compares your text to a list of cliché phrases and common redundancies. According to the AutoCrit help, a redundancy is different from a repeated word. “He reversed the car back,” should be changed to “He reversed the car.” It is redundant to say “back” because you can’t reverse a car forward. The Repeated Words and Phrases Report has become one of my favorite tools. We all have our own patterns, favorite phrases and ways of speaking that we use habitually. It’s easy to use the same descriptors too close together and not notice because of our comfort with them. By highlighting repeated words, AutoCrit makes your unintended patterns visible. By changing the first instance of “people” to “passengers,” I can add color to the text. The second use of “door” can become “entrance.” The second “terminal” can become “airport.” The second “through” can become “into.” AutoCrit points out the repeated words and phrases so I can make my own decisions about how to handle each. The Phrases Summary Report is similar but it gives me a document-wide view. If my text has long phrases that are repeated too many times, I can find alternates that make the text more interesting. I have omitted images of the Pacing Report and the Dialog Report as they doesn’t offer much input for this particular writing sample. The Pacing Report highlights areas of the text that are slower-paced such as introspection, backstory and some descriptive passages. Though detection of this content is tied somewhat to writing style (for example, if a character thinks out loud in italic text, that content will be highlighted), the purpose is to get a visual indicator of the balance between differently-paced content areas. The Dialog Report highlights phrases like “he said,” “she replied,” “they shouted,” etc. so you can manage repetition. (I personally prefer to find other ways to “point the camera” at a particular speaker, so the Dialog report will likely be more useful to others). 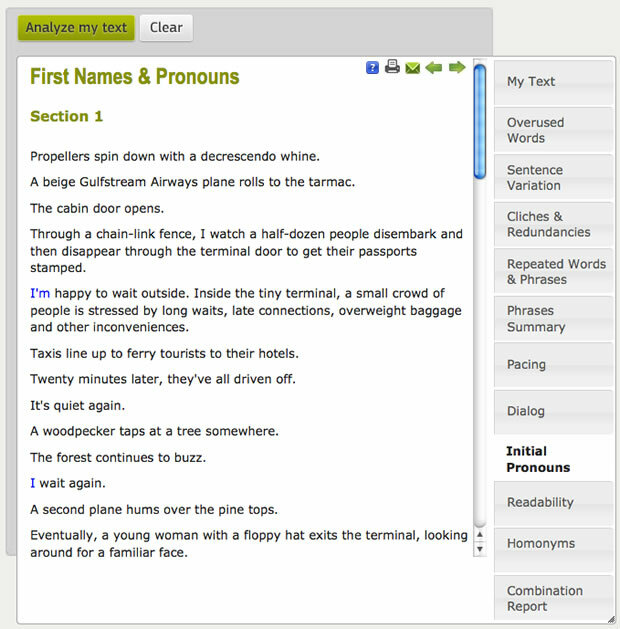 The Initial Pronouns Report highlights proper names and initial pronouns. If too many sentences start with these, the writing tends to read like a list (He did this. Bob did that. We all did some other thing.) and less like good storytelling. Paragraphs with too many initial pronouns are easily spotted and worked on. 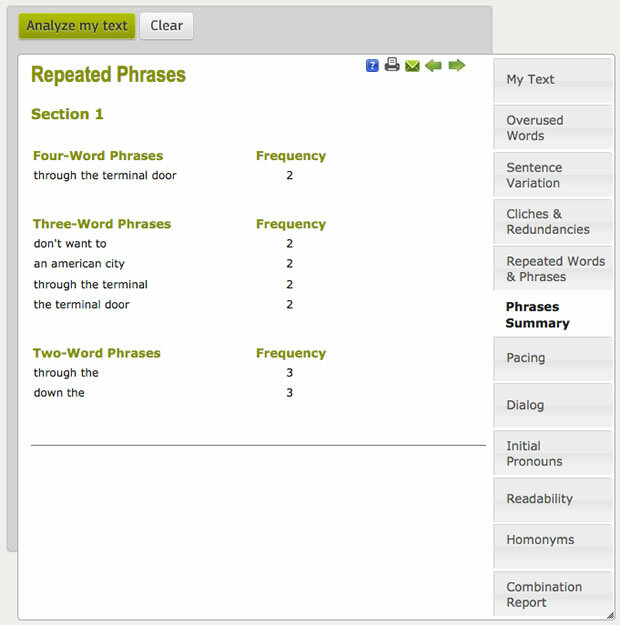 The Readability Report looks for complex words and phrases and scores your writing according to several different standards. If you are writing for children or students, this report can give you an idea what level of education is required to understand your material. Long words and complex phrases are highlighted so you can make needed adjustments. An “Advanced Settings” option lets you determine how many syllables constitute a complex word and how many words constitute a complex sentence. 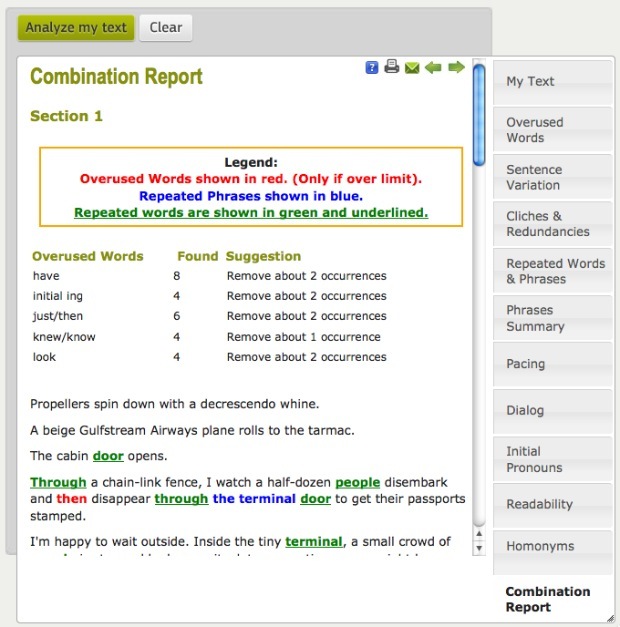 The Combination Report combines the Overused Words Report with the Words and Phrases Report. The Details: AutoCrit is powerful, simple to use and because it empowers writers to make all the decisions, it doesn’t make unwanted changes. AutoCrit is web-based, so you must be online to log in and use it. A downloadable desktop application would be a great option, but web-based applications are always up-to-date and they can be accessed by any computer platform. Free Membership is designed to allow you to try the software. It allows submission of up to 400 words, 3 submissions per day and access to 3 reports. Gold Membership, targeted at bloggers and writers of flash fiction, allows unlimited submissions of up to 1000 words and access to all reports for $47/year. Professional Membership allows submissions of up to 100,00 words and adds the ability to email reports to yourself for $117/year. The advantage over single chapter editing is that an entire book can be scanned for repeated phrases after individual chapters have been cleaned up. Conclusion: If you’re a hotshot writer, you may not need this tool but mere mortals will find it indispensable. I now run all my chapter drafts through AutoCrit and find many ways to improve my writing. I frequently discover style errors missed by the six capable people who review my work. The more you work with AutoCrit, the more you become aware of your own bad habits and the easier it becomes to recognize poor writing style. Learning to think like AutoCrit is a useful writing challenge that can be had for a reasonable price. The AutoCrit website’s offerings go beyond the AutoCrit Editing Wizard to include an extensive library of articles and useful resources for writers and editors. If you have sufficient technical skill to copy and paste text into a web browser, you will find AutoCrit easy-to-use and immensely valuable. If you’re not sure, the 30-day guarantee offers extra incentive to try it out this remarkable tool. Is their software price a reaccouring yearly fee? What about non-fiction? Is that pretty much the same end result? Can I edit my writing directly from Word or must I copy the analysis and go back and edit a line at a time? Check out latest autocrit.com. I believe you can now edit in autocrit and then paste back into Word. I’m eager to try Autocrit, too. One tiny slip on this page: “prob­lems that pre­vent the reader from your enjoy­ing story”. Hardly worth mentioning, but I thought you’d want to know. Good review. I am thinking of changing from Pro Writing Aid… It can take an hour to analyze a paragraph. Do you know if AutoCrit is faster? Does it have a plug-in for word? AutoCrit looks great for fiction, but what about non-fiction (i.e. cookbooks)? I don’t think it will help with your recipes, but cookbooks contain plenty of prose. Try a few excerpts in the free version. I think you’ll find it quite useful.